Well the last month has brought with it troubles, pain, worsening seizures yet some amazing thing too. I will go over what other things have happened but I needed to blog about the good things first ! 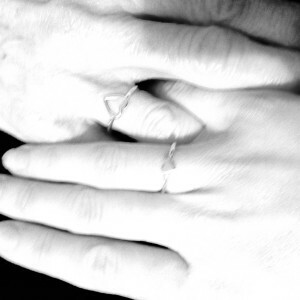 I managed to finally get the rings for mum and I resized and so we could both read them. I brought these rings back in September yet they were the wrong size. Due to stresses, strains and health it has taken me till January to get them resized. However the wait was worth it. Now mum and I have a reminder of the love we share as mother and daughter on our fingers. The best thing about these rings is I designed them – the little ring fits inside the bigger ring to make the heart whole. Just like us. I hope mum will have this reminder of how much she means to me forever. I met a lovely lady on Facebook who contacted me about writing a poem about me… She is a best selling author of amazing children’s books. 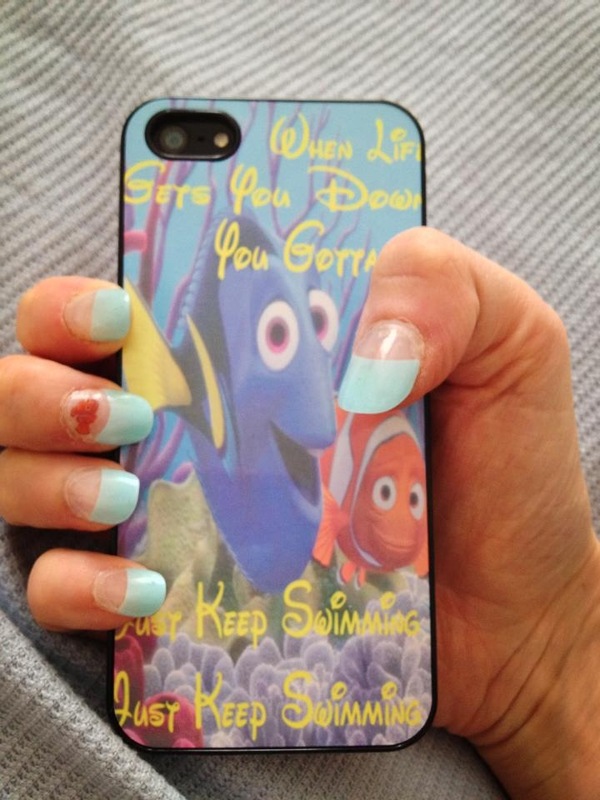 Her first one is on Amazon and there are more to come. 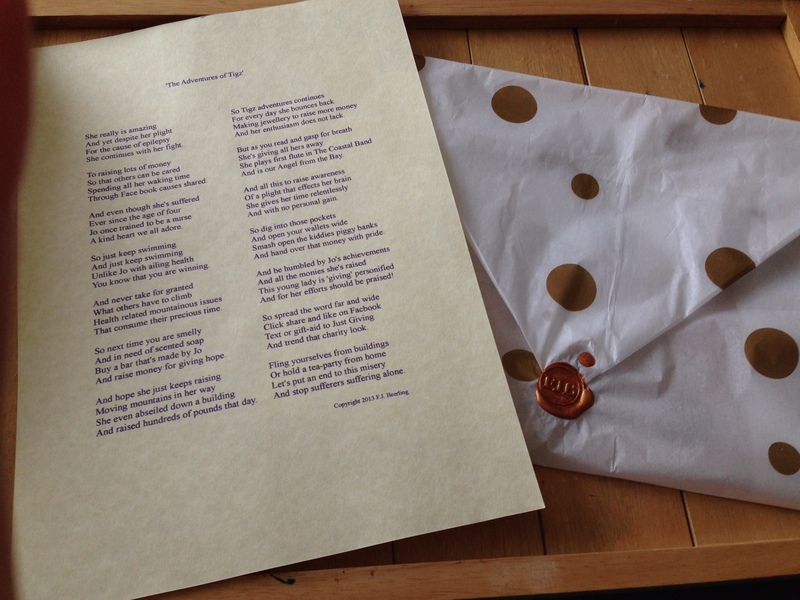 Faye Beerling uses poetry in her books and when she makes amazing pieces for people who buy her personalised poems. Anyway I met this lady and I’m sure we will be life long friends. The poem can be viewed soon when I do a special blog for it. 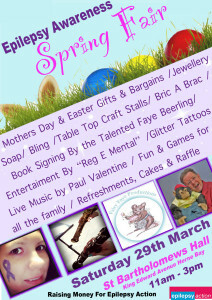 Also I have been sorting out my next fundraising event “Epilepsy Awareness Spring Fair” on march 29th 11am – 3pm at St Bartholomew’s Church hall in Herne bay . For map please see Events Page. Theres lots to organise but I’m enjoying the challenge. This event is the biggest yet but will be fun for all the family so please come along. 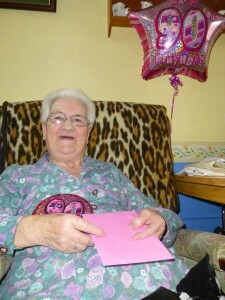 My Nan Turned 90 Years old and is looking Fab for it ! she doesn’t act anywhere near that age. 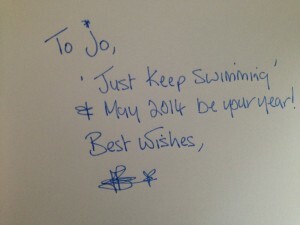 Still lives in her own home with my grandad (who is 91) and loves a bit of fun ! here she is on her birthday with her balloon & Badge which she loved opening pressies. 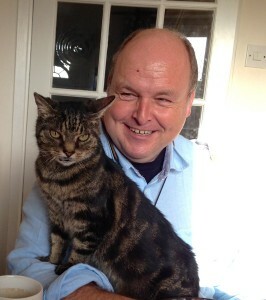 I saw a friend who I’ve not seen in 6 years…. twice. 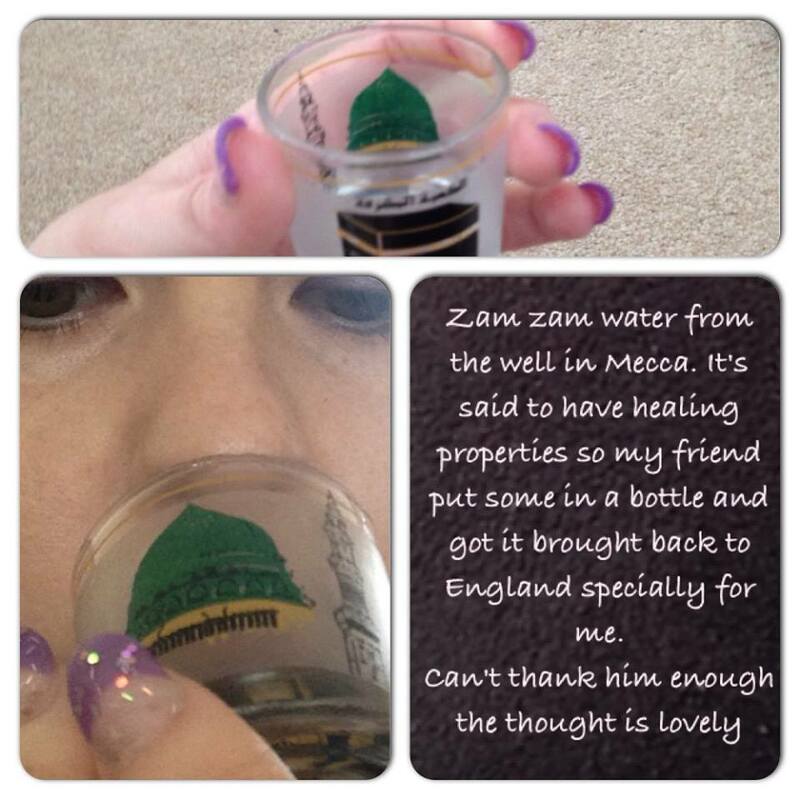 He came down one week and then again 2 weeks after bringing with him pressies he brought back from his pilgrimage from mecca including prayer beads and water from the Zam Zam well in mecca which is said to bring with it healing properties. The stories were amazing and he always brings with him a new outlook on life and everything really so i had two really good days with him. Seizures were the same but it didn’t seem to matter as much as i was just so happy to see him. Also The “Epilepsy Awareness” & “Team Jo ” car stickers have been revealed which is quite exciting ! These will be able to be brought from us at the fundraiser on march 29th and hopefully from our shop which will be up and running as soon as details are sorted out. And ….. this website ! which would not have happened if it wasn’t for Rolf Habing. 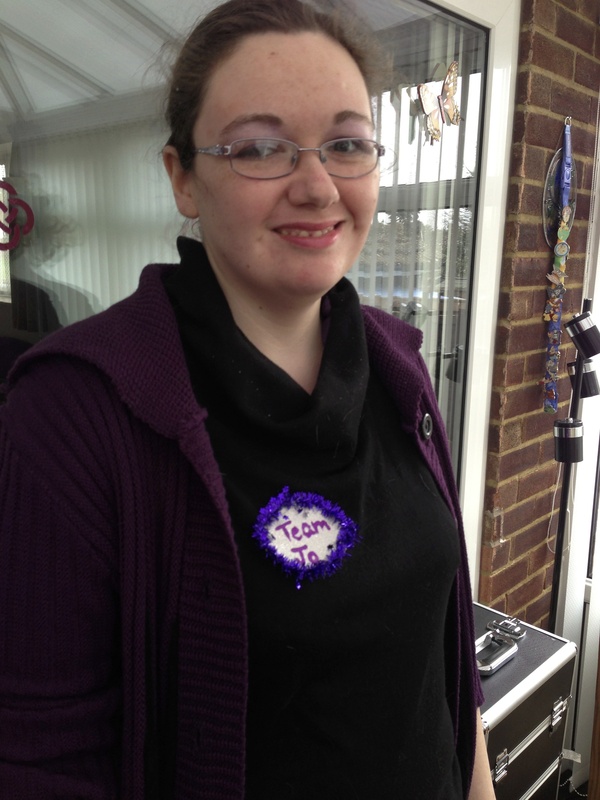 A very good friend of mine and Team Jo member who I’m proud to have. Rolf you have been amazing over the last month not only with the website but learning about everything and my life enough to stay with me and just chill or play music when I can and know what to do if a seizure occurs. The clogs, cheese and peanut butter sauce & Sprinklets was good too ! I have very few friends with the guts to be with me alone & isn’t scared of me. So thank you for everything. The website Especially. Well I know I’ve been really lacking posts recently. It’s no secret that I had been planning big fundraiser at my house, but how big it turned out was a surprise even to the optimistic me! I struggled but the planning and organising was worth it… There were lots of other background issues happening at the same time and at times I felt like I was being suffocated by my own ideas and no matter what my friends said at times I thought it was all going to be a big disaster. The morning of the fundraiser 19th October the heavens opened! I finished setting up and then looked out the window nearly turning to tears… Who was going to turn out in all of this? I continued to be busy and sort things out and friends who were helping and doing all sorts of things arrived and I was distracted from feelings of dismay. 1pm arrived and people started to come through the doors… Wet neighbours poured in. 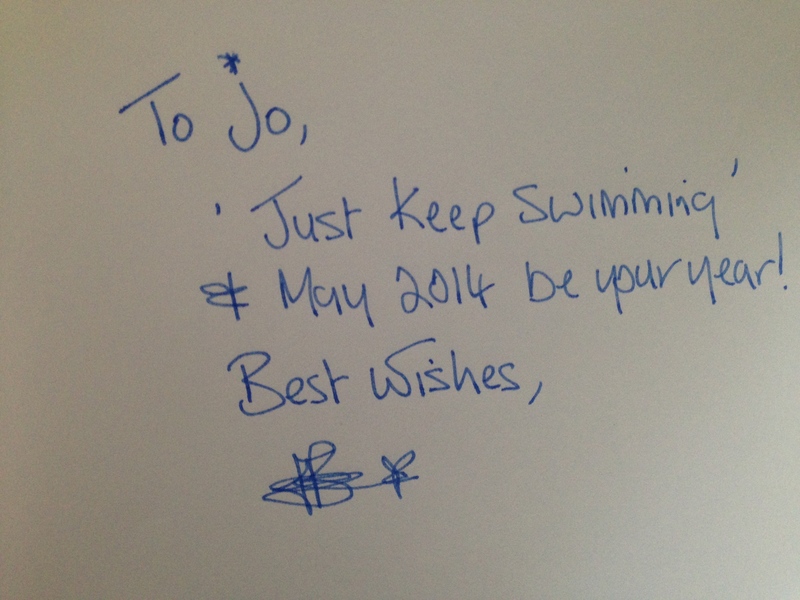 Neighbours round here are supportive and know me so I expected this. I thought that was it as they all came at once yet people who I didn’t know started to come through the door one by one two by two! Then 8, 10, 12 and I stopped counting people were walking sideways through the house to get through the stalls and displays. It was a sigh of relief but utter panic as I tried to see to them all. The end of the day everyone was exhausted. We took only a couple of pictures that day because we were so busy. 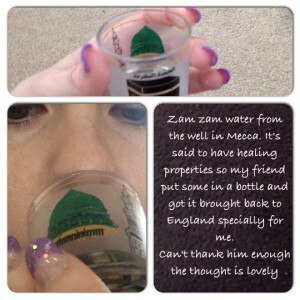 The total raised was £450 ! 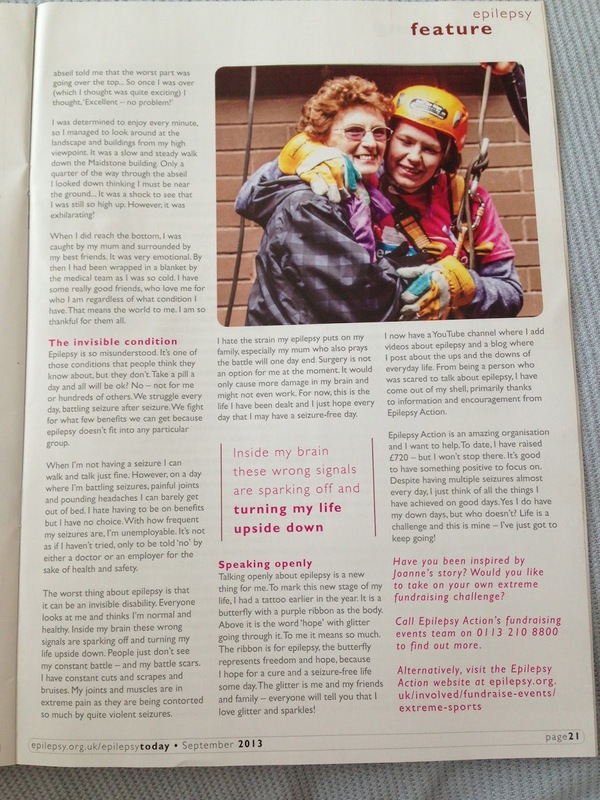 "Epilepsy never makes me shy away from life"
A few days ago I got contacted by a lovely lady called Liz. 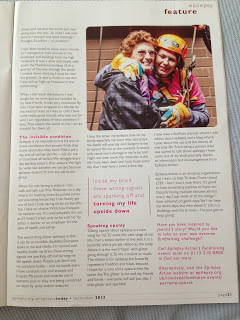 She is a reporter and done the previous articles on me and my awareness videos and doing my abseil (if you’ve not read them they can be found by clicking here Abseil article and here Awareness video articles). In our paper there is a section about people in the town. I always thought people in this section were prominent people of the town though now i have been asked i’m not so sure what their criteria is. Anyway I was asked and I agreed. I got sent some questions and replied and this is the result. While I lay awake with pain from the tip of my toes to my head after a severe seizure, what do you think I think about? how unfair life is? how I wish things were different? oh boy how depressed am I? No … I think about what Im going to do next. I think about what I can do to make a difference. 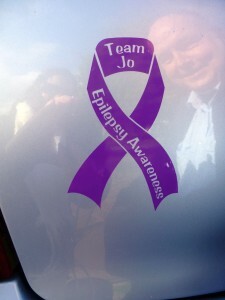 How can I raise more money for epilepsy action next. 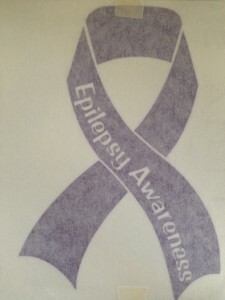 I think about events, ideas, purple things (the colour for epilepsy is purple). Well a couple of weeks ago I was doing just this. 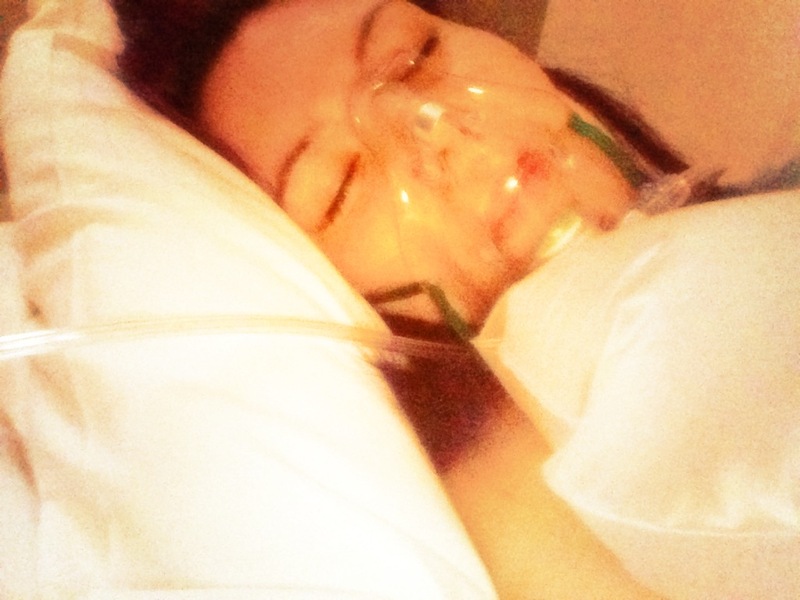 I had suffered 3 seizures that day and was laying in bed with a cat by my feet and I had a idea pop into my head. 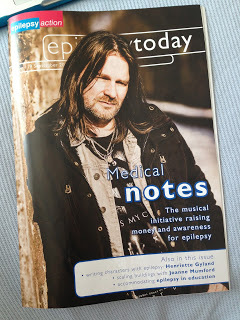 Id read the latest epilepsy action magazine which had a advert for the “epilepsy tea break” I decided I would do a fundraiser around this idea but expand it. I wasn’t content enough with just a plain ld coffee morning.. i needed something more, something that would need organisation and planning. A fundraiser was the perfect idea. 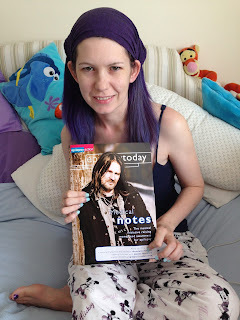 I broached the subject to mum… knowing she hates events, crowds and anything that needs such organisation people I wasn’t expecting the positive reaction I got however that was it then… Note pad and pen out and I’d started planning. 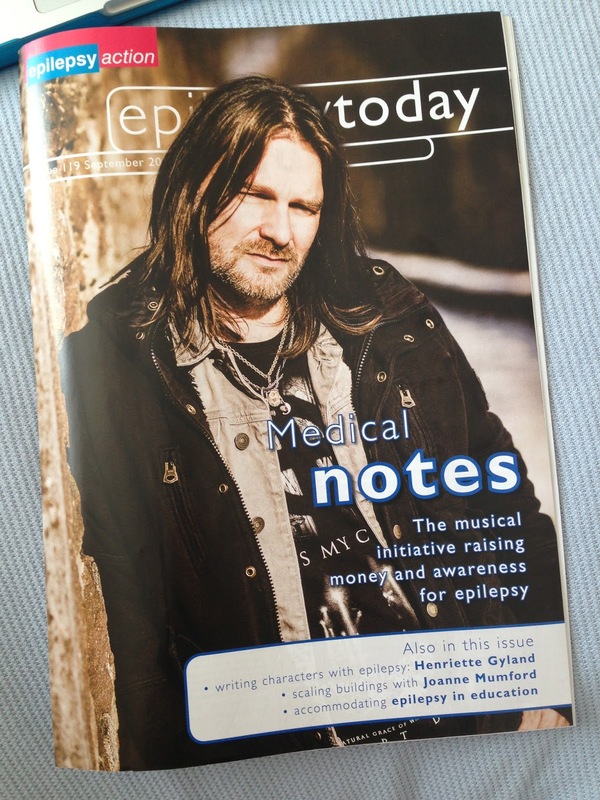 Epilepsy Today Issue 19, September 2013. 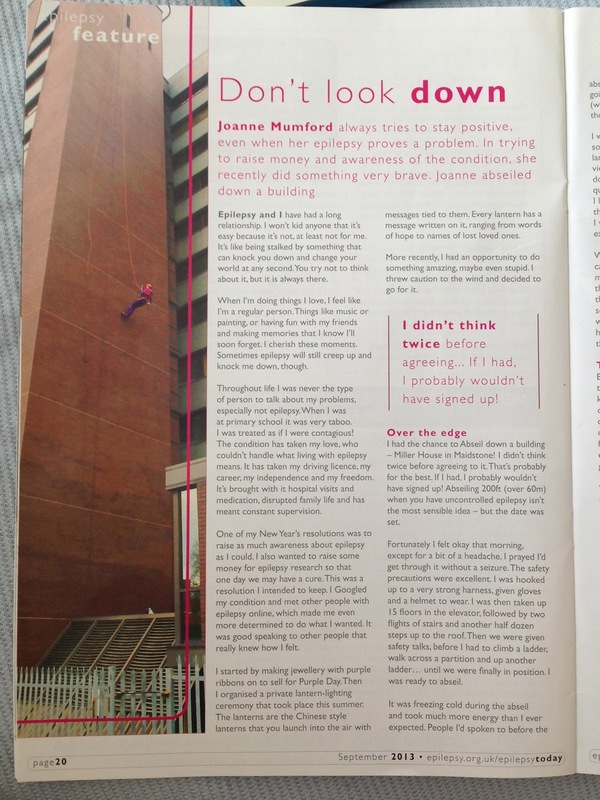 Epilepsy Today Magazine, Issue 19, September 2013, Page 20 & 21. 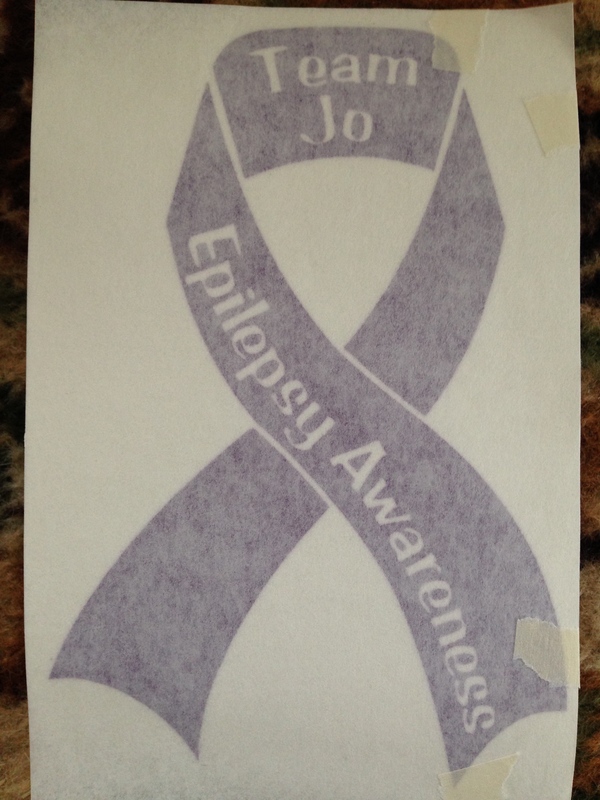 I am so proud of myself for getting this far in the world of epilepsy awareness in 6 short months of actually speaking out about it. 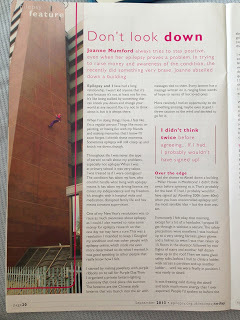 There is a lot further I want to go but for now I leave you with some happy images of me and my magazine article. Sorry for the lack of posts. 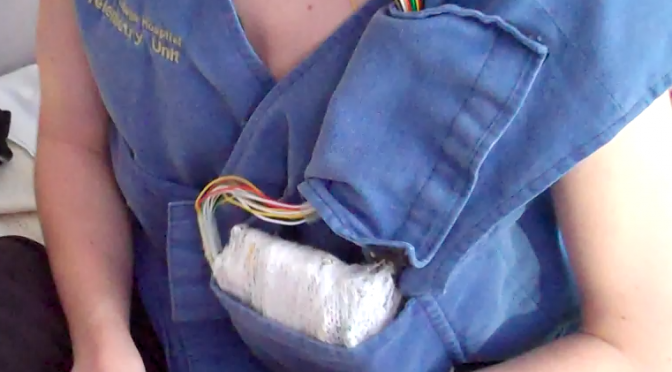 I am at the moment in hospital. I will update the blog when I can but at the moment feel too poorly.